After 49 years behind the counter in Glanbia Donaghmore Billy Finane (centre front) is pictured with his family at his retirement function in Rathdowney Golf Club. Picture: Alf Harvey. 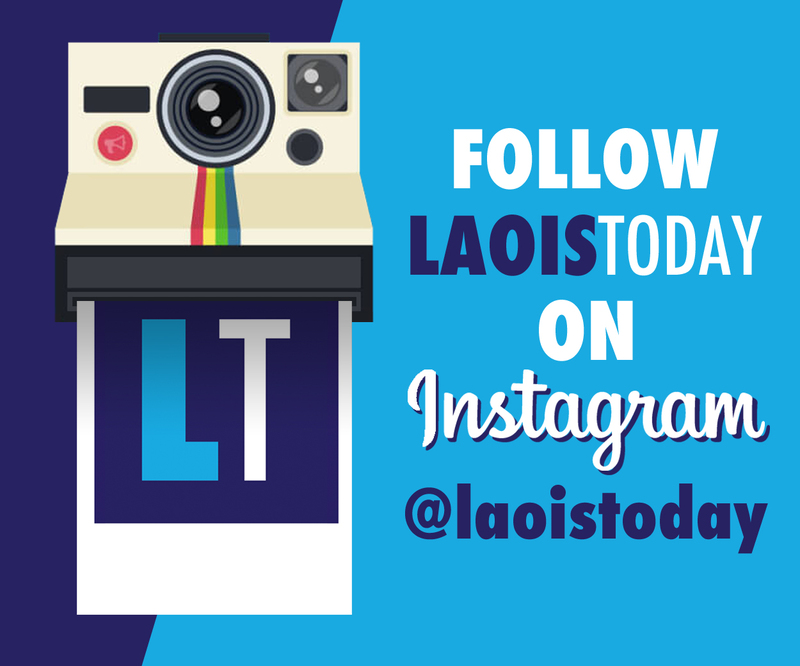 Two Laois men with an incredible number of years of service between them have retired from Glanbia recently. Mick Kavanagh and Billy Finane have amassed 79 years in the company between them. 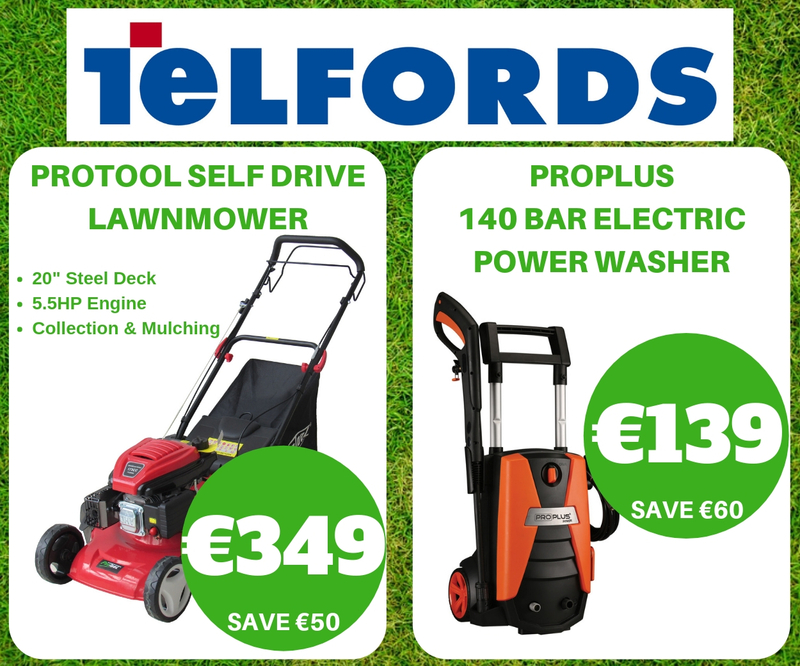 Ballacolla native Kavanagh worked for 30 years as a fork lift driver and sales assistant in the Ballacolla branch. Rathdowney man Billy Finane spent almost half a century working in the shop in Donnaghmore. 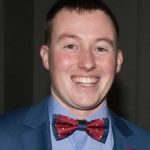 He entered the Glanbia workforce as a teenager and spent 49 years in the shop before retiring recently. 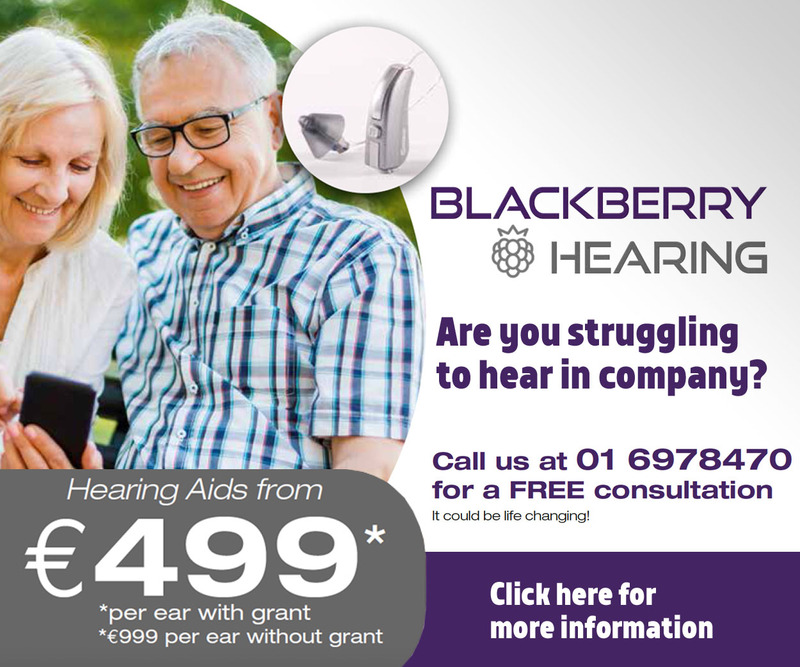 The pair were joined by their friends and members of their families at a ceremony in the Tullamore Golf Club. 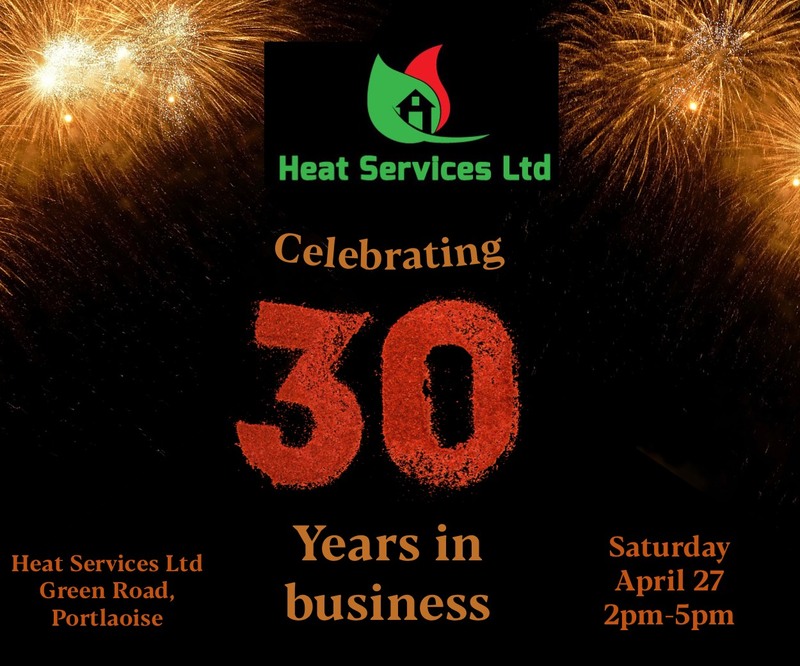 Photographer Alf Harvery went along and captured some beautiful photographs. 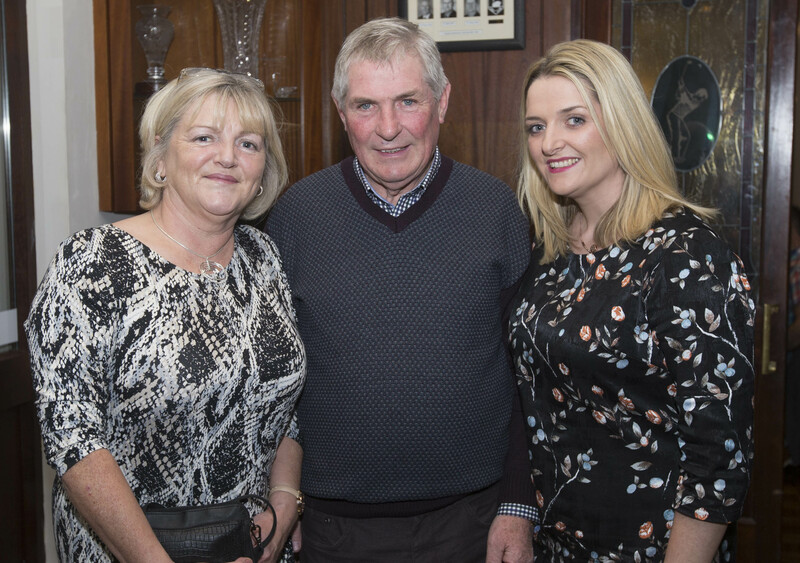 Mick Kavanagh who has retired from Glanbia Ballacolla after 30 years service pictured with his wife Bridie and daughter Orla at a function in Rathdowney Golf Club. 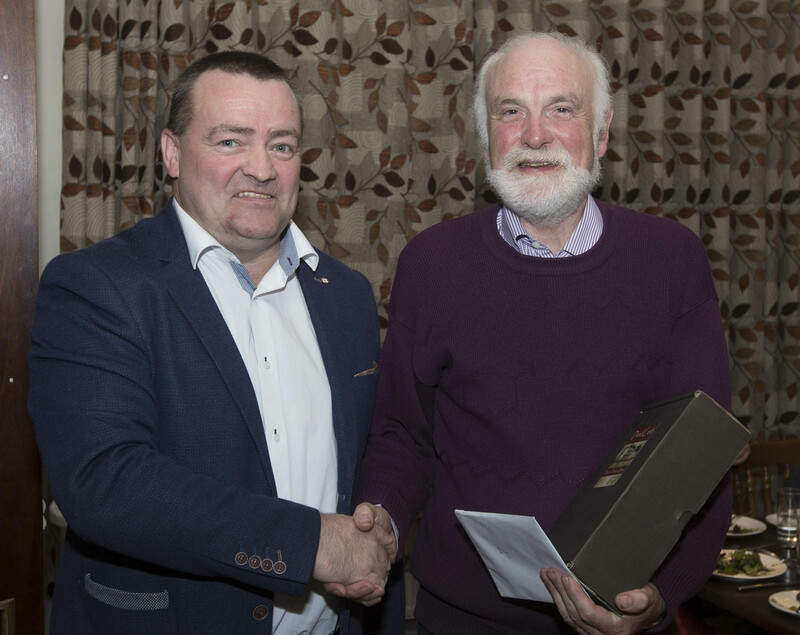 After 49 years service in Glanbia Donaghmore Billy Finane receives a presentation from manager Diarmuid Everard at his retirement function in Rathdowney Golf Club. 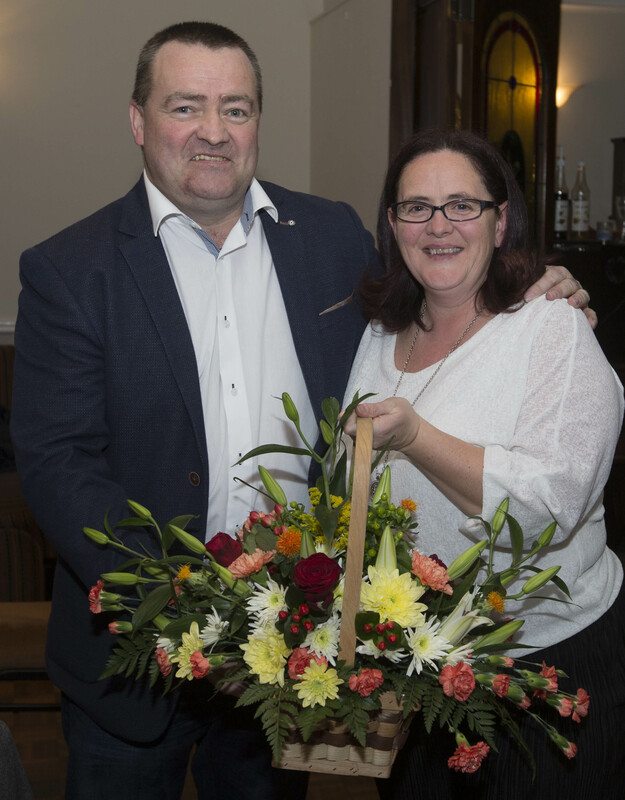 Billy Finane’s daughter Ciara is presented with flowers on behalf of her late mother Mary by manager Diarmuid Everard at Billy Finane’s retirement from Glanbia Donaghmore at a function in Rathdowney Golf Club. 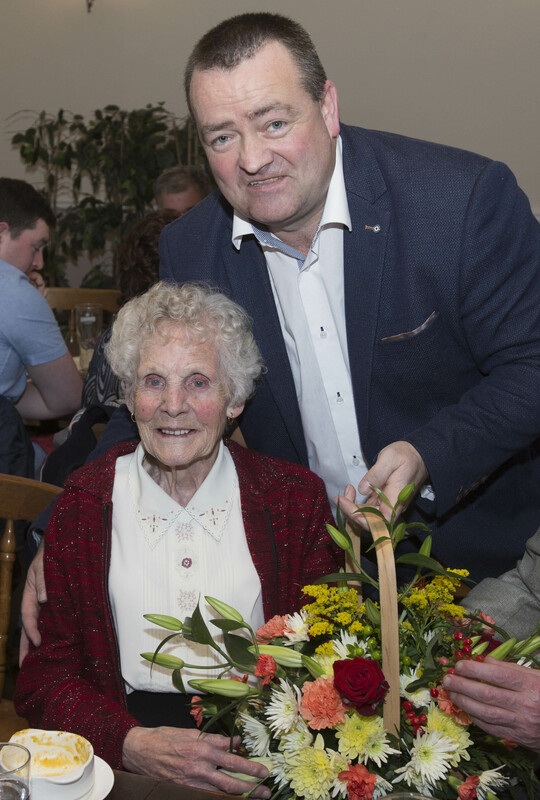 Billy Finane’s mother Hannah is presented with flowers by manager Diarmuid Everard at Billy Finane’s retirement function from Glanbia Donaghmore in Rathdowney Golf Club. 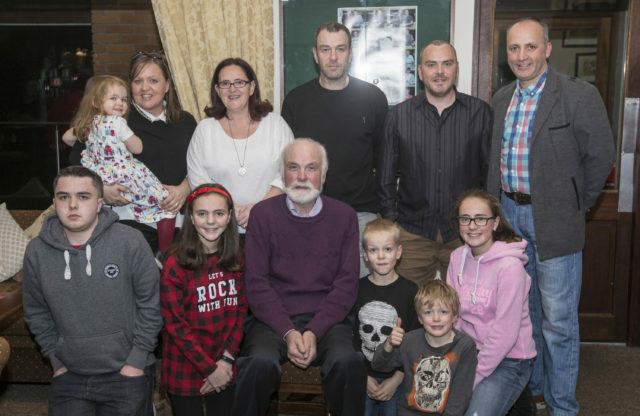 After 49 years behind the counter in Glanbia Donaghmore Billy Finane (centre front) is pictured with his family at his retirement function in Rathdowney Golf Club. 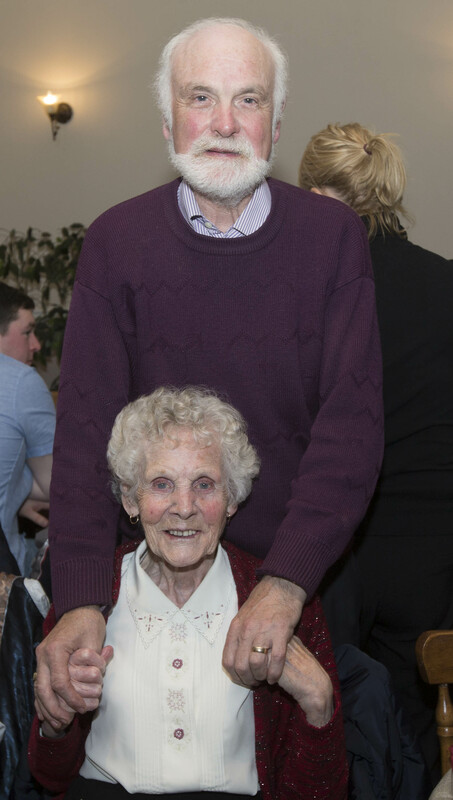 Billy Finane with his mother Hannah Finane at Billy’s retirement function from Glanbia Donaghmore after 49 years. 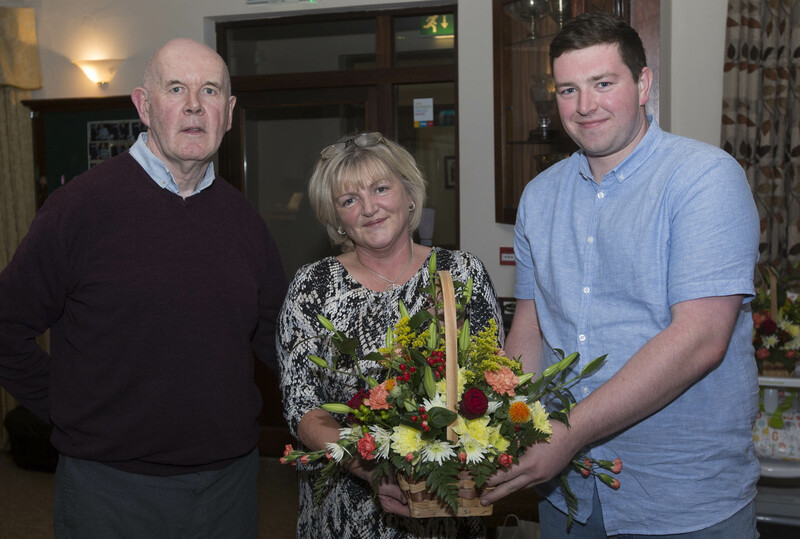 Bridie Kavanagh is presented with flowers by Adrian McCartney (right) and manager Mick Dowling after her husband Mick Kavanagh retired from Glanbia Ballacolla after 30 years service at a function in Rathdowney Golf Club. 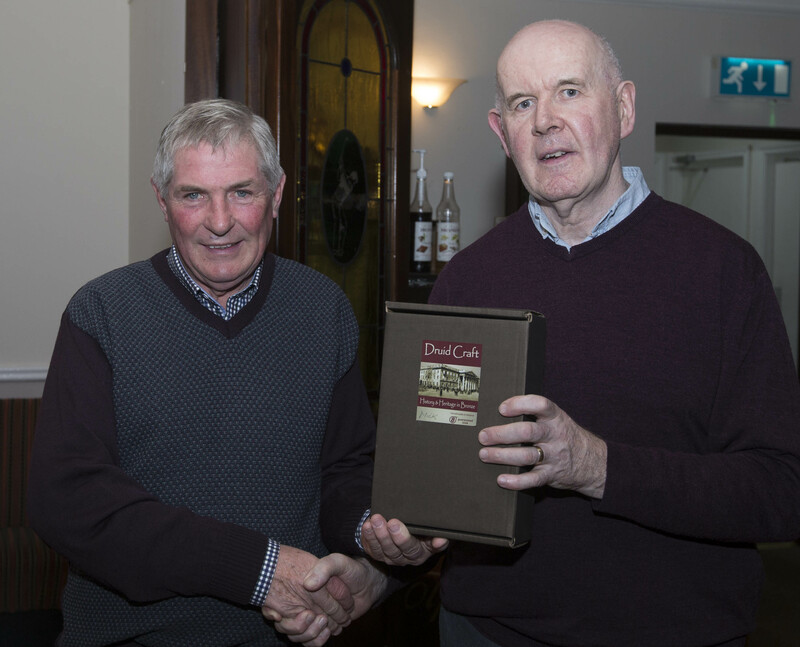 Mick Kavanagh (left) who has retired from Glanbia Ballacolla after 30 years service receives a presentation from manager Mick Dowling at a function in Rathdowney Golf Club.